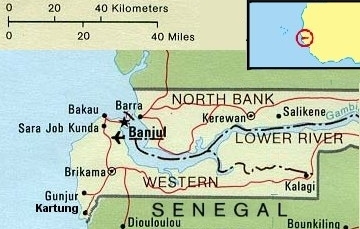 The Gambia is situated on the Atlantic coast at the bulge of Africa. The country consists of a thin ribbon of land, at no point wider than 50km (30 miles), running east-west on both banks of the River Gambia. The Gambia is bounded to the west by the Atlantic Ocean and on all other sides by Senegal. It is also the smallest and westernmost African nation. Although The Gambia is Africa's smallest nation, it offers landscapes and attractions of great diversity, ranging from broad, sandy beaches on the Atlantic to lush tropical forests, swamps, marshes and large areas of wooded savannah. The Gambia is generally recognised to have the most agreeable climate in West Africa and the Gambians are extremely friendly and welcoming, visitors should not be afraid to accept their hospitality. 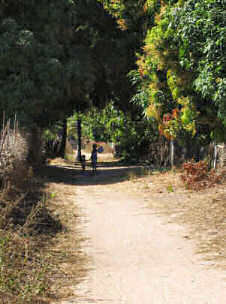 In general walking in the dark in The Gambia is safer than walking through a big city in your own country in broad daylight. Kartung (also spelt Kartong) is one of the oldest settlements in The Gambia, dating back 450 years and is situated beside the border with Senegal. The town is surrounded by sea, bush, salt flats and a salt-water creek. The people of Kartung make a living from the natural resources, which means fishing and farming. The people are mostly Mandinkas but there are many other ethnic groups living together, they are all friendly and welcoming and will go out of their way to help you. The more you get involved the more you will feel part of the village. Copyright © 2005. All rights reserved worldwide.